Media Blasting or Abrasive Blasting is the process of using compressed air to propel abrasive particles from a blast machine or blasting pot, through a hose and onto a surface at a high rate of speed in a way as to remove the existing coating and to be an effective cleaning treatment. Media Blasting for surface preparation removes unwanted coatings and leaves a clean surface ready for re-coating or other types of finishing. Used in Emporia log home restoration, many contractors use it to remove any type of coating, oil or latex or just for cleaning to remove grayed out wood, dirt and mildew. Because of the nature of the process, it is more expensive than the basic chemical strip and requires some specialized equipment. An industrial type air compressor capable of producing at least 185 cubic feet per minute of air volume must be used. Some contractors own their own, but most rent one as needed. Also a special "blasting pot" designed to dispense crushed glass, baking soda and ground corn cob media is used. It is similar to a sand blaster, but modified to handle different media. Along with this special equipment, several thousand pounds of the media itself is needed. Three to four thousand pounds in not unusual. 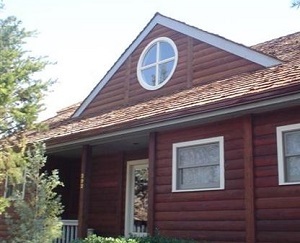 If you're looking for a professional log home restoration contractor in Emporia, then give us a call 252-266-9457 or complete our online request form.